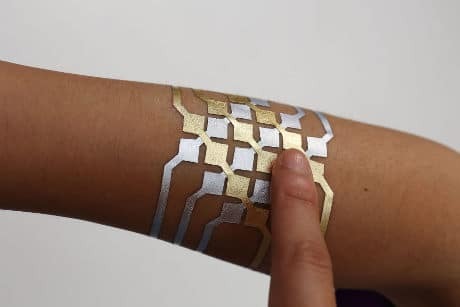 A group of students from MIT Media Lab have teamed up with Microsoft Research to develop interactive and customizable on-skin electronics equipped with an NFC chip for transferring information to a mobile device. As well as wireless communication, the DuoSkin devices will allow the wearer to make touch inputs – such as controlling a music player – with a stroke of the finger, the researchers explain. “DuoSkin is a fabrication process that enables anyone to create customized functional devices that can be attached directly on their skin,” they say. “Using gold metal leaf, a material that is cheap, skin-friendly and robust for everyday wear, we demonstrate three types of on-skin interfaces — sensing touch input, displaying output and wireless communication. DuoSkin devices communicate using NFC, whose tags comprise a chip that connects to a coil. We fabricate this coil using gold leaf, customized to various shapes and sizes.